Parents are lining up to sue the makers of Hatchimals, Christmas 2016's hottest toy, claiming they were victims of a marketing scheme. A woman from Bakersfield, Calif. is listed as the primary plaintiff but other customers have joined the lawsuit against Canadian toy company Spin Master, according to files obtained by Consumerist . The lawsuit claims the woman bought a Hatchimal for $50 from a California Wal-Mart on Jan. 14, 2017 as a birthday gift for her daughter. After giving her daughter the toy, legal documents claim the pair "followed the instructions included in the packaging, but the Hatchimal failed to hatch. The toy remains unhatched in its egg." Advertising materials for Hatchimals indicate the toy — which consists of a large plastic egg containing a robotic toy animal — is supposed to "hatch" after a specific set of instructions are followed. Spin Master's website indicates "hatching time varies" and that each Hatchimal is unique. They estimate the hatching process can take from 10-to-40 minutes to complete. The lawsuit claims its plaintiffs followed the instructions but "were left disappointed when their Hatchimal failed to live up to its name." "When we purchase an iPhone, we expect it to make a phone call," the legal documents read. It goes on to claim millions of families were victims of a "bait-and-switch marketing scheme perpetrated by Spin Master." 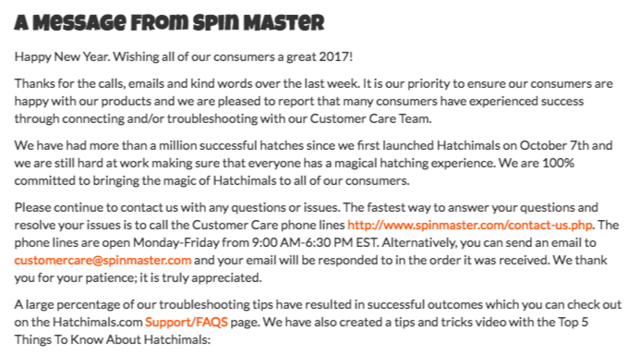 Spin Master has not directly addressed the lawsuit but in a statement on its website, the company acknowledged that customers had been working with its troubleshooting team to help hatch some of its Hatchimals. In a post to its Facebook page on Dec. 25, 2016, Spin Master said, "We are sorry to hear that some of you are having challenges with your Hatchimals." "We are pleased to report that many consumers have experienced success through connecting and/or troubleshooting with our Customer Care Team," a statement read at Hatchimals.com. Read the full statement below, as it appeared on Jan. 25, 2017. Hatchimals were apparently a big success for Spin Master. The company's stock soared at the Toronto Stock Exchange in November 2016, as the holiday shopping season ramped up. The law firm that filed the class-action lawsuit claims it wants a court order forcing Spin Master to recall Hatchimals, as well as unspecified monetary damages for the affected consumers.